Divisions between leading contenders in South Kordofan’s elections are widening in the results period, following what was largely a calm vote in the tense Sudanese border state. The race pitted incumbent governor, NCP-backed alleged war criminal Ahmed Haroun against the SPLM candidate and deputy governor Abdelaziz al-Hilu in a heated contest. Party rhetoric sharpened shortly after polls closed, with both the NCP and SPLM preemptively claiming that their candidate for governor had won. Analysts have warned of the possibility of violence breaking out in the highly-militarized state, should the exercise be viewed as illegitimate or mismanaged. Election results, originally slated to be released at the beginning of the week, are delayed due to disagreement and distrust between the two main parties over the tabulation process. On Monday, the National Elections Commission broke the parties’ impasse, by proposing to have the sorting, counting, and aggregation of votes conducted by three committees made up of party officials, representatives of the media, and election observers in state. The process was estimated to take at least three or four days. 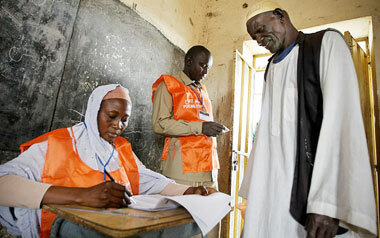 It is critical that all stakeholders, including the Government of Sudan, government of Southern Sudan, state authorities, political parties, and civil society, work together to diminish tensions in South Kordofan and respect a peaceful electoral process that reflects the will of the voters.